A Bahraini senior official Tuesday said the Gulf diplomatic crisis opposing Saudi Arabia, Bahrain, United Arab Emirates (UAE), Egypt on one side and Qatar on the other will not be permanent, indicating therefore a likely settlement of the worst crisis that has ever shaken the region. “I think that the issue we have with Qatar is not something of a long-term nature – the dispute is going to get solved sooner or later,” said Zayed Al-Zayani, the Bahraini minister of industry, commerce and tourism. Zayani made the comment at Future Investment Initiative conference in Riyadh also attended by Saudi Crown Prince Mohamed bin Salman who is rumored to be a staunch supporter of Qatar’s isolation. The quartet on June 5 parted diplomatically with Qatar accusing it of backing terrorism. The four cut off air, sea and ground links with the tiny oil-rich monarchy. The longstanding crisis has affected business in the region. 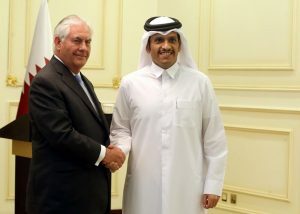 The Saudi camp, US Secretary of State Rex Tillerson noted on Sunday, is not willing to start talks with Qatar, which says it will not abide by conditions set by the four. The Saudi-led quartet issued in June a list of 13 conditions for the normalization of the ties. The US mediation has stumbled on roadblocks. Monday, a former President Trump’s senior advisor, Steve Bannon indicated that the crisis was sparked by the US President’s visit to Riyadh in May. Bannon who was Trump’s Chief Strategist said Washington was not happy about Qatar’s binary stance.